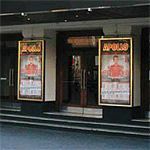 Do you work at Eventim Apollo? Varies by event, please check with the venue for more details. 14's and under need to be accompanied by an adult (over 18) and in the seated areas only. Children under the age of one year are not admitted for adult shows. If the show is not specifically aimed at an adult-only audience, children aged one year or older are admitted providing they can sit up straight in a seat and that the parent is confident the child is old enough not to be a distraction for other members of the audience. Children over 1 year old must have a ticket purchased for them. Accompanying adults will be asked to remove any noisy children. If any discounts are available for children the maximum age to qualify is 16 years unless specified otherwise. Smoking area available outside the front of the venue. 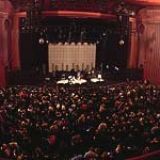 What did you think of Eventim Apollo? Was extreamly dissapionted not only my family,but I saw 15 families walk out it's meant to be aimed at children,wallace and gromit were on a small screen for approximently 15 min during the first part of the show! Myself and 15 other families walked out after the first part. It is not for children,its just an excuse to have a live orchastra! What a waste of time and money!